Theo Epstein made it clear his plan for the Boston Red Sox when he took over prior to the 2003 season. The rebuilding of the Red Sox farm system has led to numerous players who have come to play at Fenway Park and elsewhere in the Majors. Players like Dustin Pedroia, Jon Lester, Clay Buchholz, Jonathan Papelbon, Jacoby Ellsbury and many more made their first pro starts with the Sox farm clubs and have become household names in MLB. Now, the next wave of prospects is making its way up the proverbial ladder. 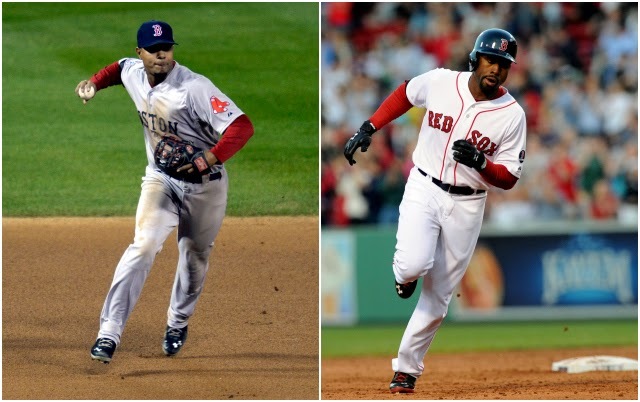 Xander Bogaerts (left) and Jackie Bradley Jr.
are among the first of many prospects breaking in the big leagues. It began on Opening Day last season when Jackie Bradley Jr. started in left field at Yankee Stadium. In the fall, Xander Bogaerts made his presence felt when he helped the Red Sox win the 2013 World Series. Really it was two years ago when Will Middlebrooks took over at third base for Kevin Youkilis and Felix Doubront became a fixture in the rotation. But they are just the beginning. One of the reasons pundits like the Red Sox future is not just because the club turned itself around and won a championship, but because Ben Cherington has carried out the vision that Epstein left. Boston's farm system is top notch - a credit to the scouts and coaches on the lower levels who groom young men into MLB-ready players. Injuries, trades and other unforeseen things happen that can prevent players from ever reaching The Show. But these players certainly have what it takes and could soon be on the biggest stage in the game. A look at that list shows the Red Sox have put stock in drafting and building the farm system. That, and the fact that it nearly makes up an entire starting lineup. Kudos to Cherington and his staff for providing a bright future - at least on paper - for the Boston faithful.